Entronix EMP Reviews Recently Reviewed! Overall: My former company was a medical center composed of approximately 5 million square feet that included a hospital, research buildings, and higher education. We were able to employ the Entronix energy management platform quickly, efficiently, and economically. Using the Entronix energy management platform we were able to monitor energy consumption and retrieve past data painlessly. In the past, all of this information was on the building automation system which was very time consuming to find, collect, and present. Also, we ran into issues with lost data with the building automation system. Even though Entronix was located more than 400 miles away, we received excellent customer service. I reviewed the current state of the art with regard to energy management platforms and after reviewing more than 20 companies (trade shows, online searching, word of mouth, presentations, interviews, etc. ), I found that Entronix was the leader in their field and way ahead of the rest of the game. Their ability to be flexible and to adapt and develop quickly allowed Entronix to accomplish everything we needed for our large campus. Pros: Entronix provides us with an in depth look into the operations of our building, Pennzoil Place, a 1.8 million sq. ft. Class A+ commercial property completed in 1976 that allows us to outpace or competition in energy conservation, operational insight, and troubleshooting. Pros: Ease of use and customizable features coupled with their lower entry cost make them a no-brainer in my opinion. Overall: I have been an Entronix customer since they first went into business and my experience with them is nothing short of fantastic. I first utilized them to analyze and view my buildings large electrical consumption. With the custom dashboards I was able to identify trends and tests cost savings strategies in realtime which led to dramatic reductions in costs. Entronix background in facilities, controls and strategies help make this all possible because put quite simply "they understand the business from an owner/operators point of view". Unlike many competitors in this business, they understand that a canned product is not always a fit for all so they willingness to listen and help create custom features absolutely separates them from the rest. I look forward to our next success with Entronix. Cons: Not much. At first, it was the only source of which I was aware. The others I have now found seem to be either less capable or more expensive, not necessarily in initial costs, but life cycle cost wise. Overall: I started small with two electric power meters on a use of about 300KW. I am working on adding at least 4 more meters to the Entronix node in this building. They will be recording chill and hydronic hot water BTUs as well as hot and cold domestic water use. This will be followed by several (4+) more buildings with higher uses. Entronix has a good system for collecting energy data. My initial install was fairly easy to do. Being a government organization, it is always tough to implement processes such as this. Entronix has been a great help in doing this. Pros: Speed and reliability of data. Since web/cloud based, I can access from any web capable device from anywhere in the world, with no compromise of service. Entronix staff is very open and responsive to the customer request for special request and features. Impeccable customer support! VERY easy to use and navigate, which provides an incentive to access regularly, no discouragement of "learning curve" or relearning. Cons: Although capable of interfacing with other software platforms, it will take moderate to major expense from the 3rd parties to integrate. That's not necessarily a fault of Entronix, just the reality of software integration. 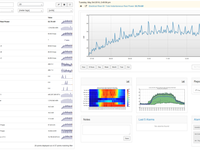 Overall: Profiling and monitoring the energy performance of our campus, plus using as a tool to validate and verify energy conservation projects. Pros: Ease of use, Graphics are excellent. Cons: There are not any to speak of. Overall: Thank you for assisting us reach our energy management goals produced by Entronix they really are excellent! Energy management programs produced by an independent third party such as Entronix provide a professional and unbiased standard that the industry relies on for making critical decisions. In addition, their software is easy to use and is updated regularly. Thank you once again for your contribution to the industry. Pros: The software is very simple to navigate. Easy to create reports for multiple locations and usage data. The ability to customize is very attractive. Most that I have dealt with in the past don't give you as many options. Overall: Our business has increased by recommending Entronix to our customers. I have not found anything that I dislike with the software. The software easily connects to any current BMS. 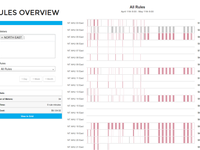 Pros: Very intuitive to operate and included multiple views designed for who may be looking at it, between an engineer, CFO, or administrator. The platform can integrate into an existing EMS, which it did in this case, or function as the EMS, OR can work around an existing EMS in tandem. The manufacturer of the HVAC units on this project said nobody could get into their units but them or the warranty was void and would not cooperate(!) Entronix used audio sensors in this project instead of their usual application and was able to assign fault characteristics over time to anomalies, very versatile work from this group, they did the software design and the installation of their equipment. The system is paid for monthly with a smaller project cost, the customer thought that it was very affordable. Cons: I like that if they do not have a solution for a customer they will evaluate the problem and determine if it is worth developing for, but that is an obvious thing to me. Every big company should be able to do this but won't take the time to unless it's a very expensive (profitable) problem, and then you can't get the right person or a straight answer. Overall: I was a part of the greater building solution project and worked with Entronix, so I do not benefit, they were just fun to work with and good people. Pros: Web based program that can be customized to suit our needs. All information is stored in the cloud and can be accessed at anytime. Cons: For our needs, we had to conduct a building electrical outage to install the CT's for the power meter. Pros: very easy to use. I am very impressed with the simplicity of the software and how it makes my job easier. The graphics are very easy to use. The customer service is very good as well. Cons: The only thing i can say is that the software system covers many different types of building operations and that I need more education on how to use the different modules. Pros: Working with Entonix gives you direct access to industry leaders. They have a diverse background with much experience. Proven ability to customize software/programming to fit specific client needs. The multiple views and exporting features makes reporting very easy. The software can go into comprehensive detail or quick dashboard viewing. Cons: As with any software platform, it took time to learn site navigation. After working with it for a week or so became proficient at changing views, exporting data and adjusting certain settings. From sales, customer service, and installation everything is done first class. Pros: What I like most about the software is the ease of use and ability to track just about anything we need. I also love that it is cloud-based so everything is backed up. Pros: Easy to use and easily identifies anomolies. The Entronix team responds very quickly and can customize views remotely. Cons: Honestly, I enjoy all the features this software has to offer! 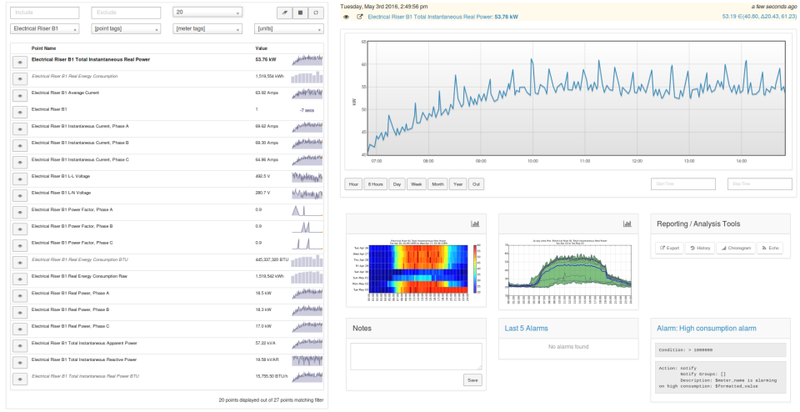 Overall: I use Entronix EMP on a daily bases to analyze the performance of campus buildings. This platform has a large selection of graphical representations which is great for analyzing data! Ability to report at the granular level! Pros: Many softwares offer fault detection, however I challenge anyone to find one with the ability to pinpoint occurrences with this level of TRUE reporting detail. Very impressive! Cons: Software works as intended. Entronix, invests heavily in continued R&D. Staff is friendly and responsive. We haven't experienced any negatives at this time. Overall: Primarily fault detection with our clients. Results have been increased life cycles within mechanical systems and maximum operational efficiencies. Pros: Customization reports via a secured web gateway!!! 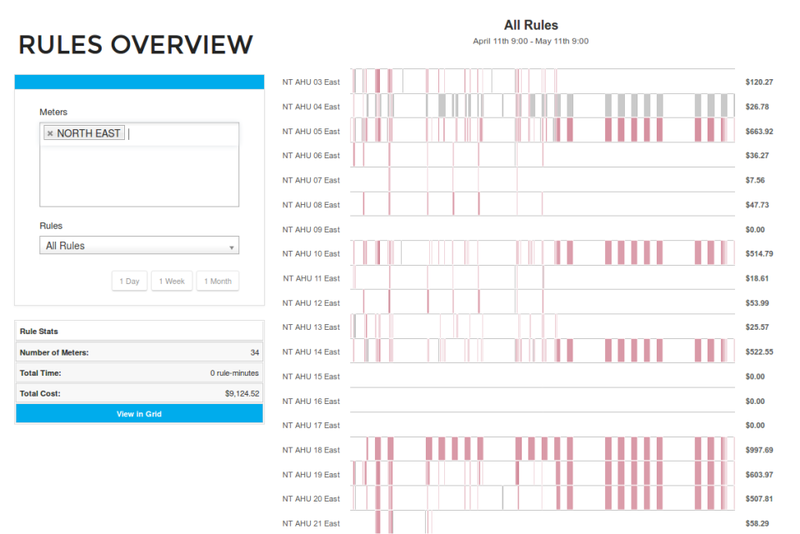 Great for gathering real-time user data for Budgeting, PM Development, KPIs and Fault Detection. Can also be used for tenant revenue billing. Overall: Identification of potential energy saving opportunities. In addition, I now have a better vehicle to help me determine ware to spend my deferred maintenance dollars for the biggest bang. I am still searching, but they have made every modification I have asked for and more so presently I don't have anything to put in the Cons category! Pros: Ease of use, accuracy, and completeness. Exceeds other industry offerings and offers valuable insight into powers usage and demand. Overall: Innovative, high value, blows away the competition. Fanatical support. Worth your time & energy to engage. Recommendations to other buyers: Use it and you will save more money than you ever thought possible. Group of buildings. It's also very user friendly. Cons: Sometimes the meters and nodes loose their communication. You have to physically reset them. It doesn't happen often, but it happens. Pros: What is amazing is their ability to customize solutions specific to your equipment. This is important when you have equipment from different suppliers on several different platforms. Overall: Energy savings through equipment optimization. Additionally, I can monitor my equipment's likelihood of failure--measuring harmonics. Service is great with fantastic response time. I recommend Entronix to all building, facility or property managers. Very flexible platform. Easy to use. Pros: The Entronix platform has enabled us to integrate may different versions of meters and equipment under the one platform. This has enabled us to use different manufacturers of equipment from an Eaton UPS to a Shark 200 Data Logging meter and have the data available under the one user friendly platform. A very unique product. Cons: Difficult to find any negatives. There have been problems as any integrator would know when you mix different formats of data into one platform. However working with the Entronix technical support, so far all of the problems have been solved. Overall: Staff are always very helpful. Great technical support and good technical communication. There technical support is easy and helpful to work with. I like the software's adaptability. The Entronix team is always Johnny on the spot! Pros: I like that we can customize the software to meet our constantly changing needs. Ray and his team are always welcoming new ideas and happy to make changes for us on the fly. Pros: The ability to customize it to my needs. I worked with the team and they added the features I needed in 1 work week, which allowed me to make the sale to my customer. Excellent tech, and top shelf customer service. Pros: Tremendous capacity for complex or simple applications. Multi-tenant and multi-building independent metering options. Cons: Didn't hear about them sooner. Spent a lot more money elsewhere, and never got our system set up correcty after 6 months of trying. Entronix got the whole project customized and completed in under 30 days. I've worked with several Energy Management platforns, and Entronix is, so far, the best. Pros: Flexibility, Customer Support,utility of preconfigured reports, easy and fast to use and you can really save time. Cons: Althought we know they are working to solve it, the platform is not mutilanguage. Pros: Ease of use. Excellent platform for analytic use. Overall: Recently we had Entronix and their team of professionals design and construct several measurement and verification systems for HVAC equipment. Their expertise and professional demeanor were beyond my expectations. Design, deployment and support of solutions unmatched by larger companies. Pros: The customization of the software and adapting the hardware to the existing topology is excellent. Their ability to scale solutions up or down with the same quality of build is critical to building a right-sized application that can also expand. Cons: While the quality of build is excellent, their resources are somewhat limited compared to larger companies. However, all those resources are US based so quality and efficiency in development is enhanced. You'll have a hard time finding something better! Pros: Easy to use. Easy to learn. Perfect for every level of energy management. Overall: We recently started to use and develop an application on our boiler house with these guys and it has been nothing but amazing. These guys are extremely responsive to our real needs to make sure that we get exactly what we need from our project all while making it so simple to run, that it is a literal pick up and use application. There is almost zero training time required which means we dont have to sacrifice time to stop and individually train new users. I'd highly recommend this for energy management usage on all levels! Pros: very flexible...easily intregrated into our systems. We needed custominzation that easily worked with our existing systems and this Entronix is just that. Overall: practically anything I want is available in Entronix...whatever I can think of, Entronix has way to do it. No one is really doing what Entronix does...they connect to everyone's data, the customize to and listen to what the data is telling us. I would like it if others in the industry simply agreed to standards such as IEEE or the like. Overall: I used Entronix EMP to analyze the consumption of an important data center and to implement an alarm system. The availability of the staff to meet my needs was excellent, they are always available and very fast for the implementations and customization I needed. I've been in the audit business for more than a decade and I haven't seen anything like this! Cons: To be honest, I haven't found any. I'am sure there are things that can be improved, but at this very moment, they're one step ahead visualizing my needs. Pros: The software is pretty simple to use even if you haven't had experience as a programmer; but the thing I like the most is that the company is more than willing to accommodate any suggestions in order to incorporate a custom-made approach regarding the necessities of clients. Pros: Platform is very comprehensive. It is very easy to commission hardware devices in the field. Offers a variety of views and can be customized for little or no cost. Overall: So far I have not had any issues with the platform. I can not think of anything that I do not like. Pros: User friendly interface, with plenty of room for customization. Cons: No issues at this time. There was a small issue regarding the cycling of a custom dashboard, but was immediately corrected by tech support. Pros: The user interface. All functionalities are very nice and accurate. I like because is quick and friendly. Cons: Nothing. All features are very nice. I have seen and work with many of that and I am surprised enough. Comments: We've been using Entronix equipment and software to manage out tenant above standard usage for direct bill back invoicing along with energy management of the base building operation. 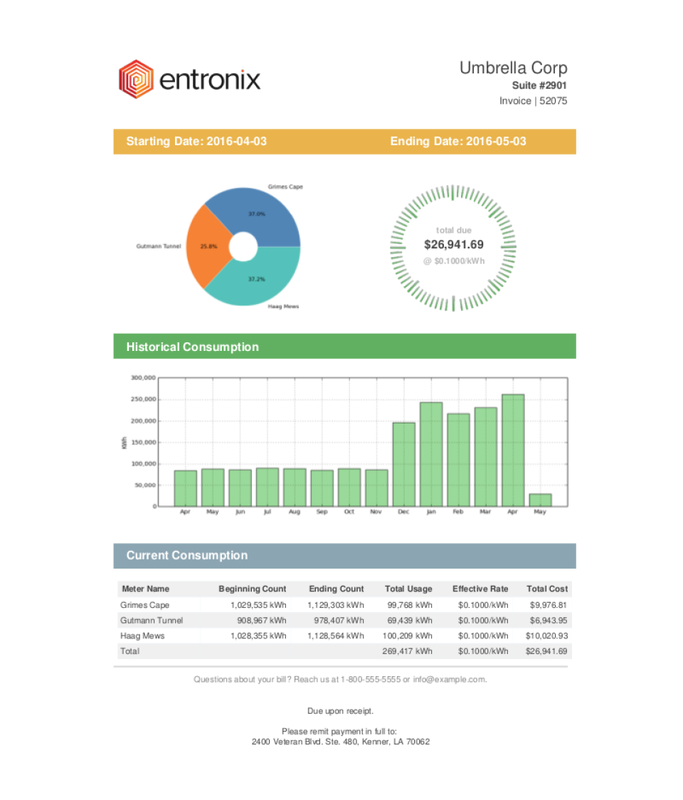 Have tested out several different Energy Management Software's over the years at different buildings and would recommend Entronix. The ease of uses, the invoicing and real time monitoring has assisted us in a reduction of engineers time physically reading the meters and energy saved by alerts we receive when consumption is outside our established ranges. Pros: Its an innovative product which can be utilised for many purposes apart from just energy data analysis. Can also be used as a diagnostic tool to fix the existing issue and optimise the system performance. 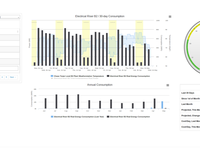 Can be used as a very powerful tool to present the energy related data to management, customers and other wider audience. Cons: Cant find any at this stage although there is always scope to improve. Inclusion of a site specific cost benefit analysis tool can be incorporated to justify the utilisation of this software. It has been a wonderful experience working with the folks at Entronix. Support is outstanding. Pros: Easy to install and manage. Custom alerts and notifications help with troubleshooting power quality issues. 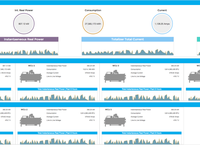 Automated tenant billing is a great feature. The company has been great to work with. Very helpful on training and set up. Pros: The service it adds to my consulting business. It's been great to use to help stand out to my customers. The Entronix team is highly professional and a pleasure to do business with. Pros: The data and analytics are of tremendous benefit to building owners/operators. The user interface is extremely logical, easy to navigate and the aesthetics look great. Cons: I've only been a user for a short period of time but the billing setup, depending on the complexity, can be time-consuming. I'm sure as I continue to become more familiar with the software this will become easier. 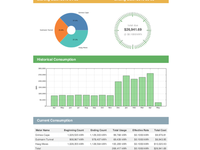 Overall: Energy management & billing for commercial and residential communities. Comments: Entronix is a simple but extremely useful tool that we use to manage the KW/hr usage in our two commercial high rise buildings as well as use the meter readings to bill tenants. I would recommend this product to anyone who is looking to improve performance relative to KW/hr usage. Working with my rep and the group at Etronix was a great experience. I would use them again. Pros: It made the impossible possible. Etronix proved to allot of people that this system could work where our other pulse meters couldn't work with the current Software. Entronix was a company easy to work with. Not a lot of pressure. Pros: Versatile user-friendly software. Has a wide variety of applications. Tech support is helpful and quick to respond. it has been a very good experience. They kindly answered all my questions and requirements. Pros: They make it simple. Both the technical and commercial aspects. This is very useful when you work with complex data tools. Cons: I miss a Spanish version. There are a lot of reports and it is a lithe difficult to follow for whom non-English speaking fluently. Comments: We work a lot with Entronix in building out our IoT products and services we offer in the commercial climate control space. Pros: we can customize the software to meet our constantly changing needs. love that it is cloud-based so everything is backed up. Cons: Inclusion of a site specific cost benefit analysis tool can be incorporated to justify the utilisation of this software.